Do you know what you'll be doing from the 5th to the 6th of December, 2015? No. You won't be Christmas shopping, silly. You can leave that for later. What you'll be doing instead is coming down to the Shriners Auditorium, 99 Fordham Road, Wilmington, Massachusetts, so you can check out the Northeast Comic Con And Collectibles Extravaganza, 2015. Well, not only does this pop-tastic event boast numerous appearances by such comic book creators as George Perez (Our Guest of Honor), Alex Simmons (Archie Comics), Jack Purcell (Malice & Mistletoe), Joe St. Pierre (Spider-Man), Arthur Suydam (The Walking Dead), plus many, many, more, but on top of that, you'll also be able to check out a plethora of presentations, games, contests, and stalls relating to collectibles, music, antique toys, clothing, cosplay, jewelry, crafts, pop culture, and basically anything to do with geek and nerd culture in general. 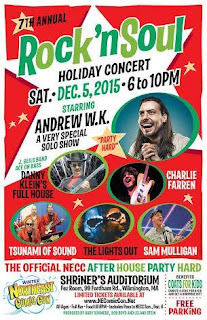 Now for a bit more information on what I've just mentioned please check out this previous press release, keeping in mind that since this announcement the 7th Annual Rock n' Soul Holiday Concert, called After House Party Hard, will also be taking place at the con. Among the musical talent you'll hear performances by Andrew WK, Charlie Farren, Tsunami Of Sound, Sam Mulligan, plus Danny Klein and his Full House. Only 200 party Tix available, and admission will be on Saturday, the 5th of December, between 6pm and 10pm, at the FEZ Room in Shriners. Also, something else I best mention would have to be all of the exclusive items you'll be able to find at the Northeast Comic Con And Collectibles Extravaganza. So if you want a All You Can Drink Collectible Mug, you'll get a All You Can Drink Collectible Mug. If you want a Life's A Beach NECC Exclusive Comic Book, you'll get a Life's A Beach NECC Exclusive Comic Book. 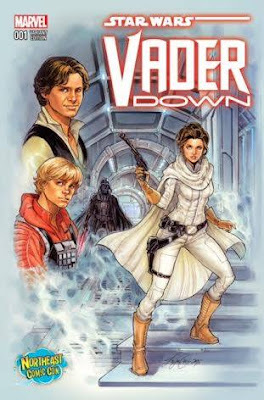 And if you want Two, Yes Two, STAR WARS Variant Comic Book Covers, well, may the force be with you, as offers are limited to a first come, first serve basis. So remember, from the 5th to the 6th of December, the 2015 Northeast Comic Con And Collectibles Extravaganza will be held at the Shriners Auditorium, 99 Fordham Road, Wilmington, Massachusetts. Weekend advance purchase tickets cost only $30 ($40 at door). Saturday advance purchase tickets cost only $25 ($30 at door). Sunday advance purchase tickets cost only $18 ($25 at door). Children between 7 and 13 weekend advance purchase tickets cost only $15 ($25 at door). This same age range will be charged $10 ($15 at door) to gain entry on a Saturday or a Sunday. Plus Children under 7 are FREE, accompanying a paying adult.